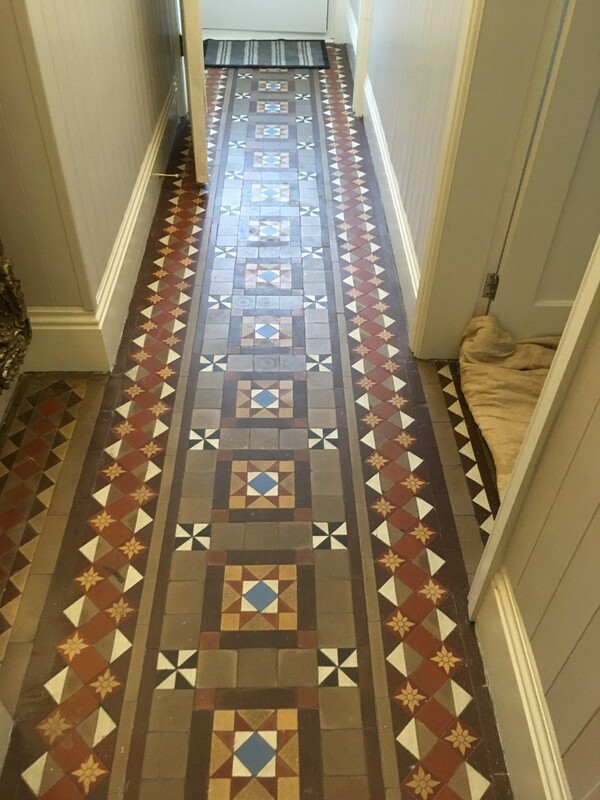 Here’s a job I completed recently at a house in the tiny town of Kirkby Lonsdale, situated in the South Lakeland district of Cumbria. 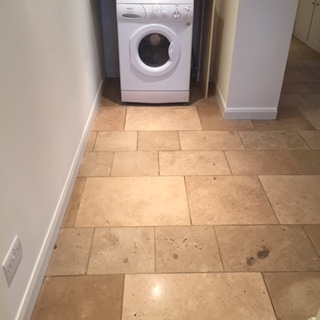 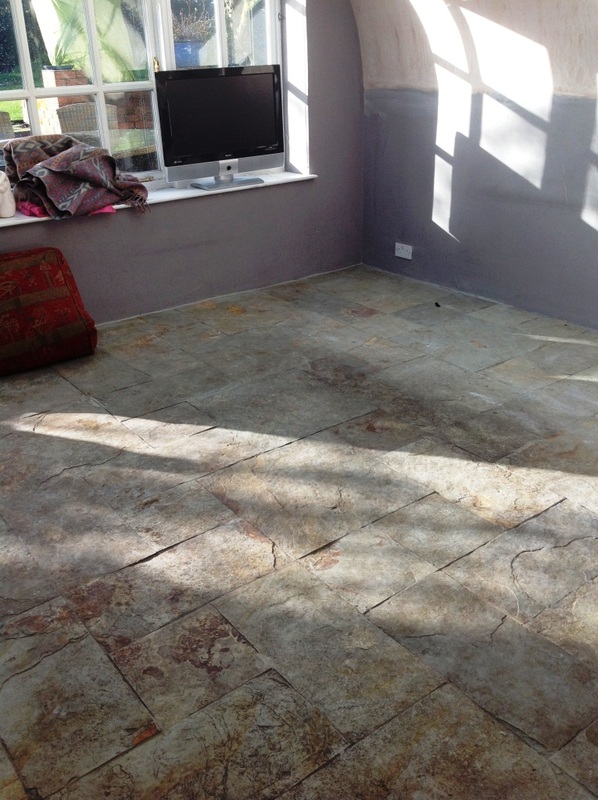 My client had a large area of Travertine tiled flooring that was in certain need of a deep clean and reseal. 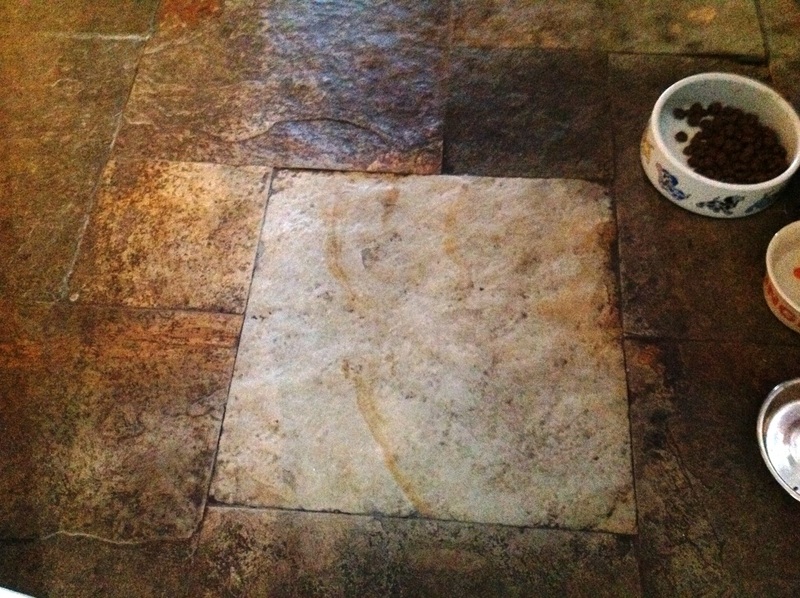 Additionally, the floor suffered from a number of naturally occurring holes in the Travertine. 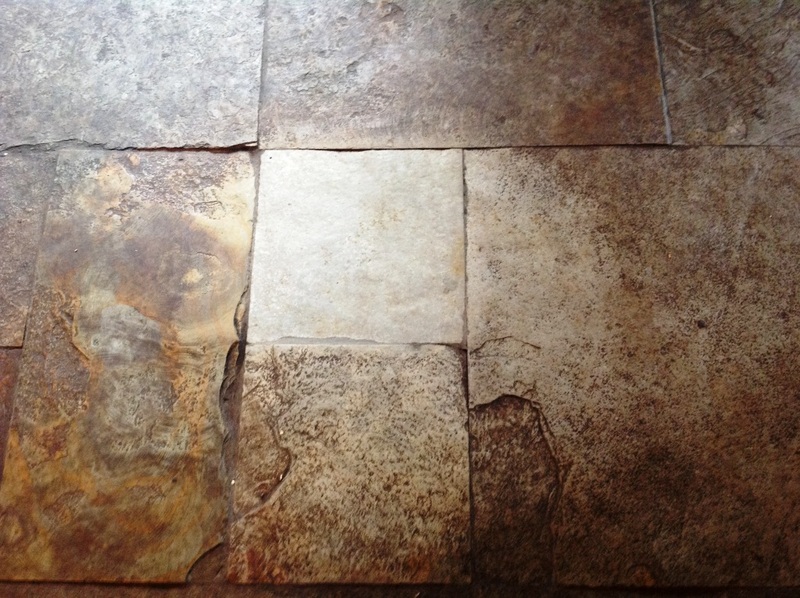 This can be quite a common problem with Travertine, due to the fact that it’s a softer material than some types of stone and I’ve often heard of holes opening up in Travertine floors over time due to the use of acidic cleaning products. 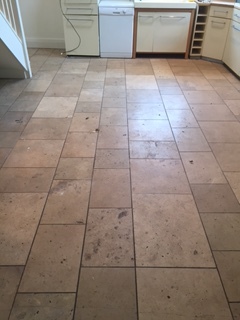 These holes needed to be filled before commencing the cleaning and sealing processes which I did this on the first day using a flexible grout in a matching shade of cream/brown. 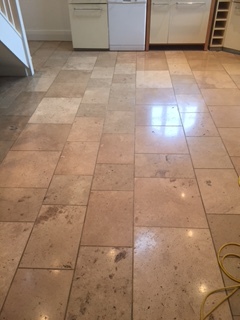 To restore the finish on the Travertine I used a process known as burnishing rather than resorting to a form of liquid cleaner which would clean the floor but not restore the appearance. 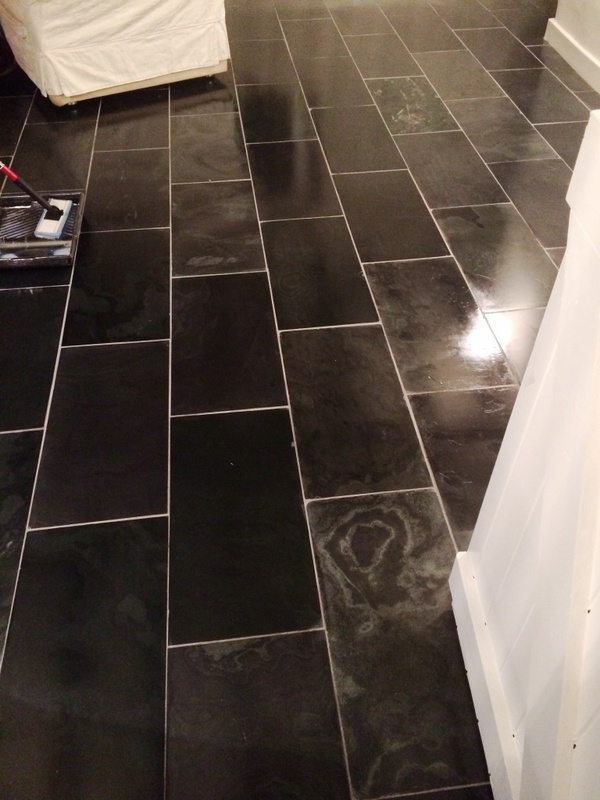 Burnishing involves the use of diamond encrusted pads in varying grits. 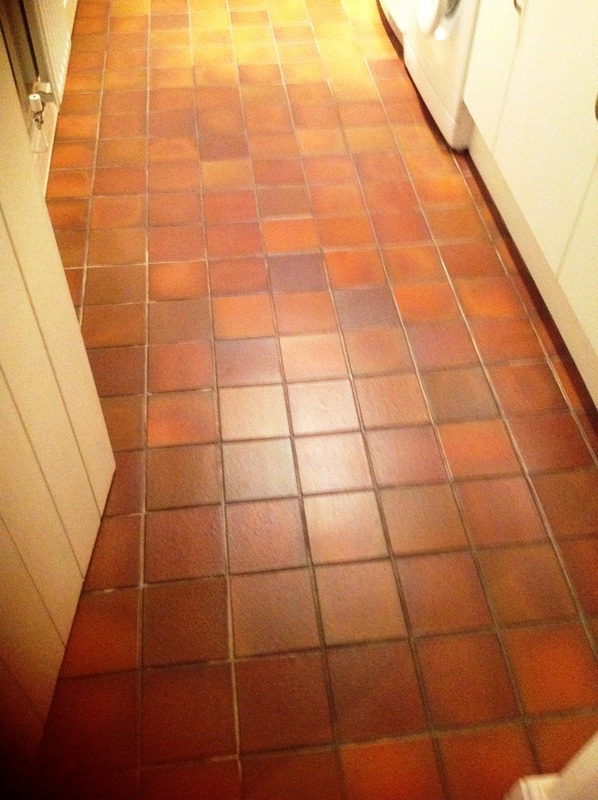 I began with the coarse pad, and worked my way through the system with medium, fine, and lastly a very Fine pad, using water to lubricate and rinsing the floor after each pad to remove the slurry. 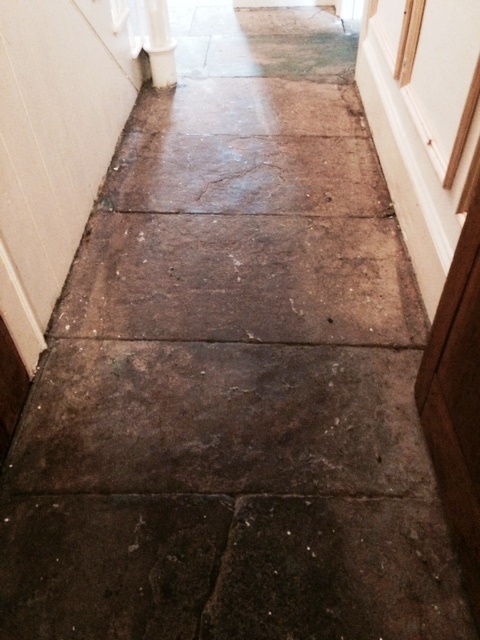 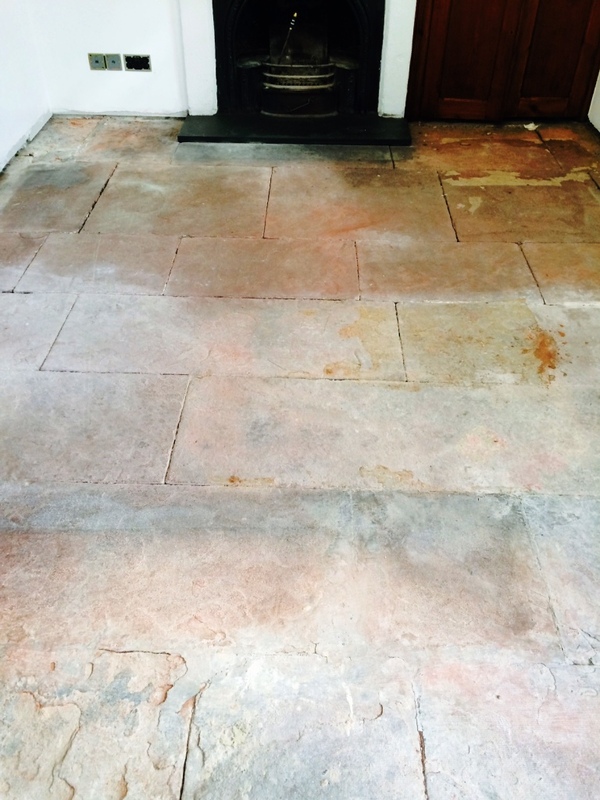 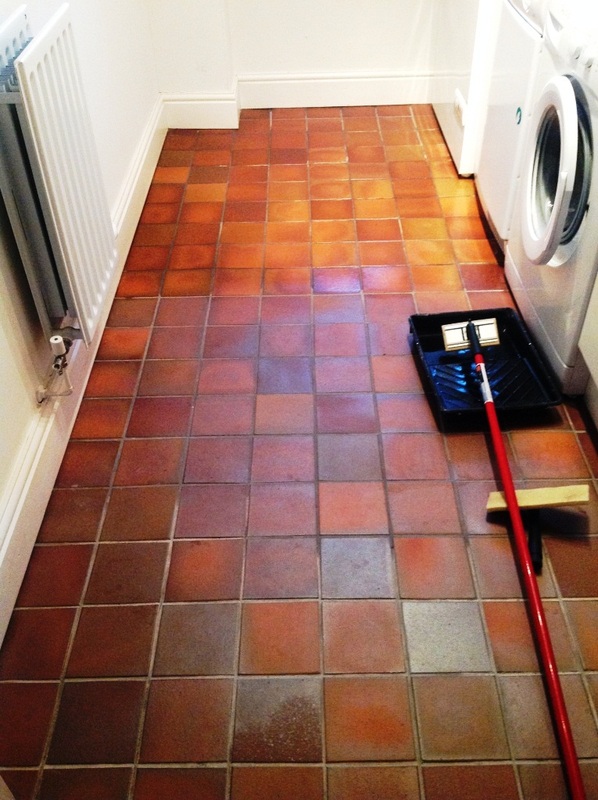 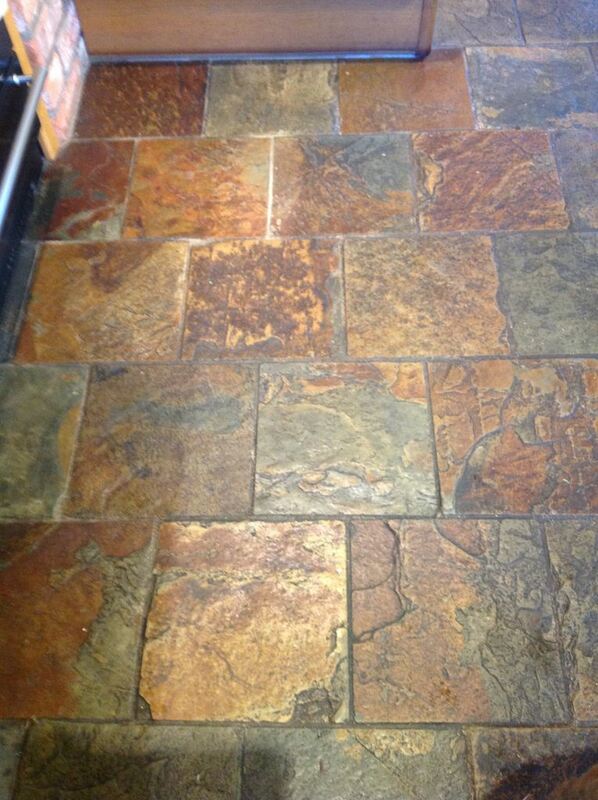 This process left the stone exceptionally clean, and with lustre restored to the floor as a whole. 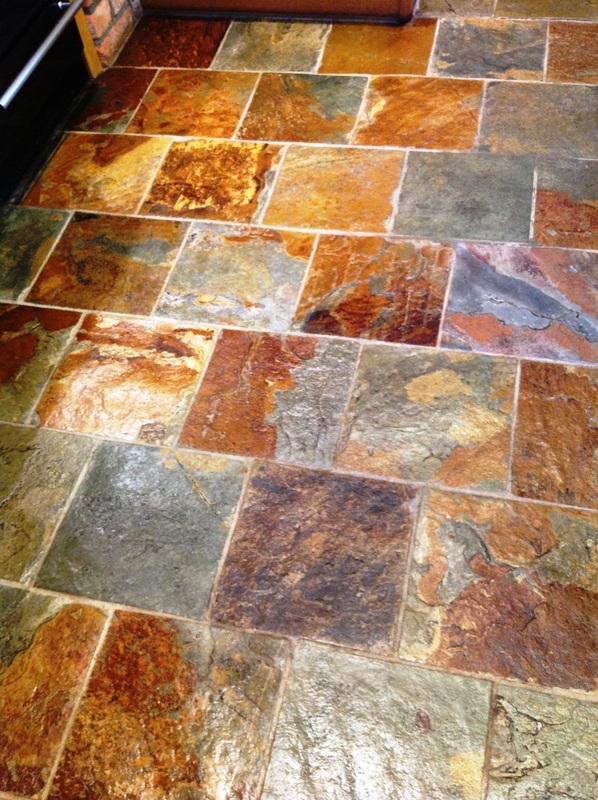 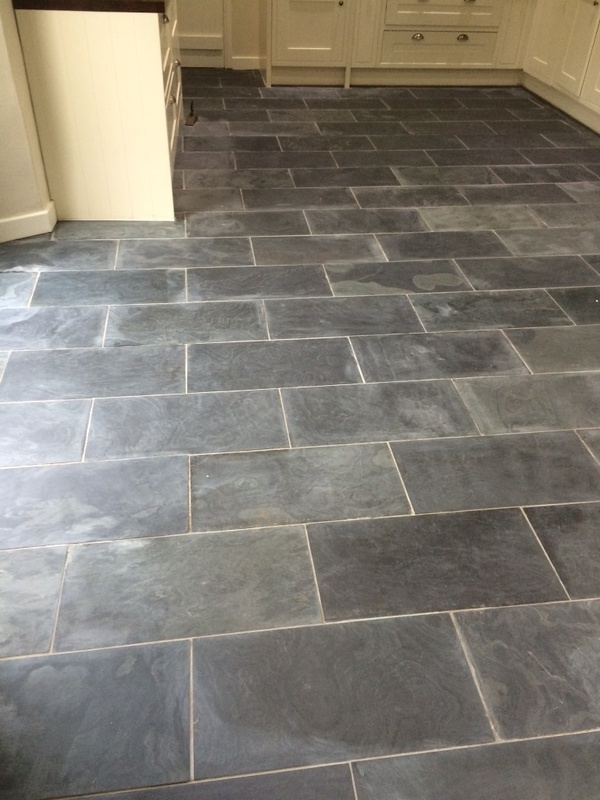 Stone floors are porous and overtime they will collect dirt which can become ingrained into the tile and make it very difficult to clean effectively. 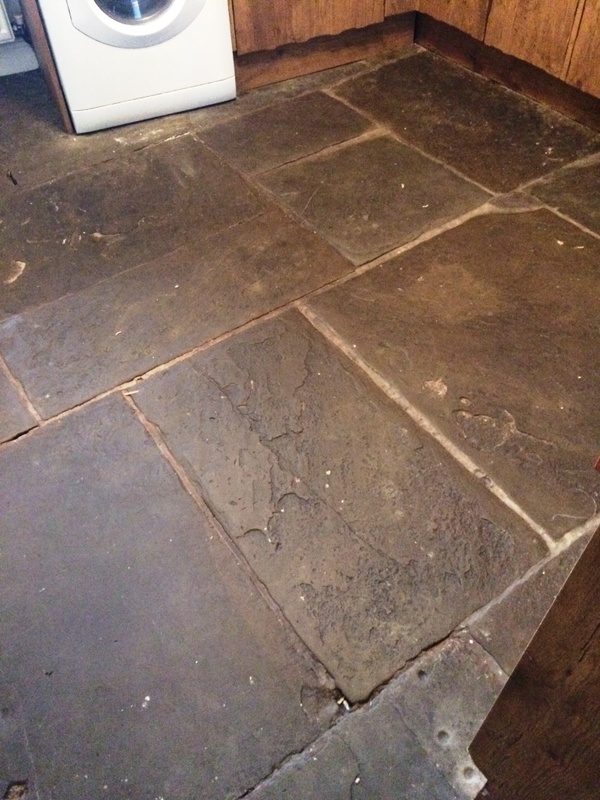 The solution is to seal the floor and so I returned to the house on the second day to seal the newly cleaned floor. 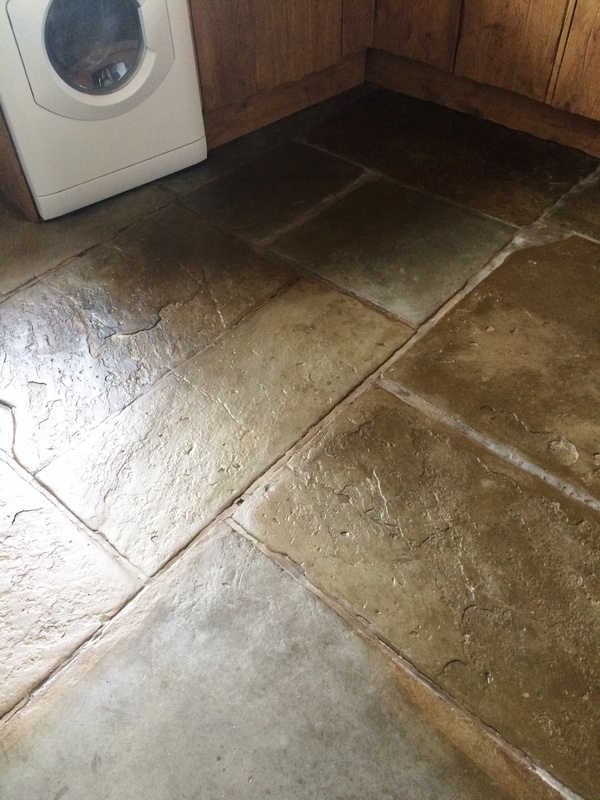 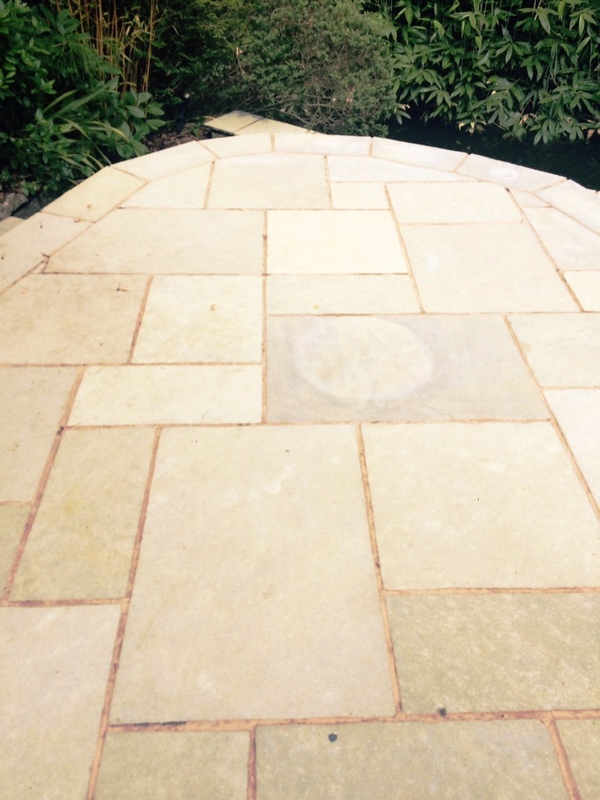 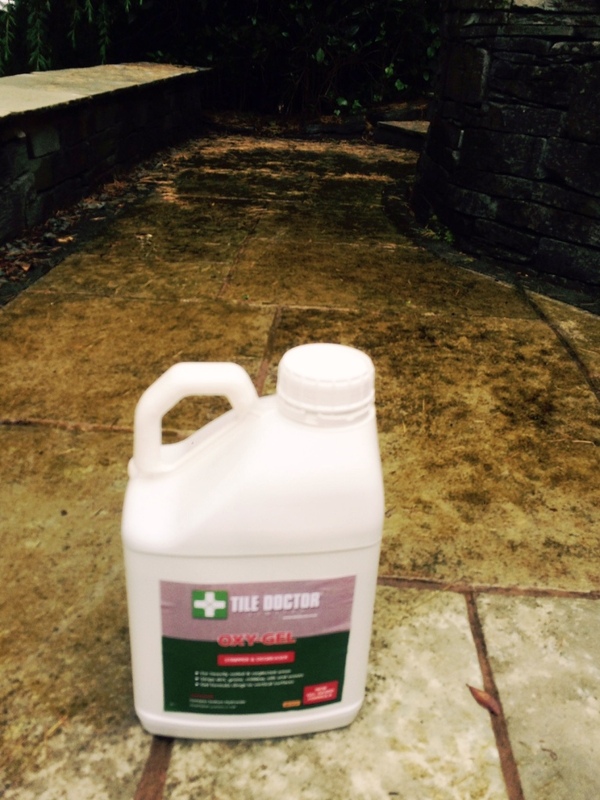 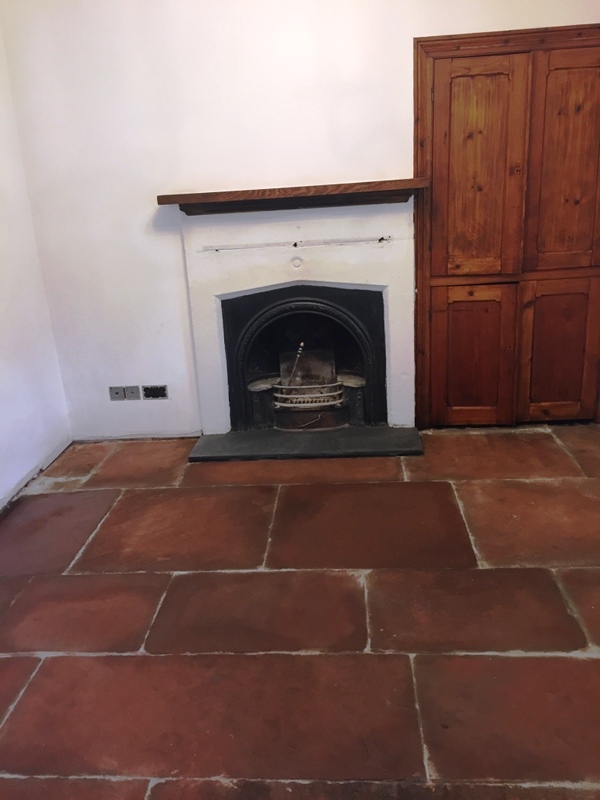 My sealer of choice on this occasion was to apply a single coat of Tile Doctor Colour Grow which is as its name suggests a colour intensifying sealant that provides durable surface protection and enhances the natural shades in the stone. 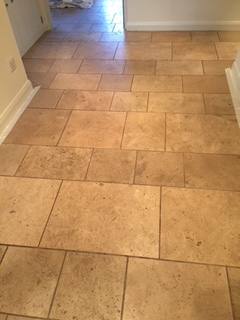 As you can see from the photographs, the burnishing process made a great difference to the condition of the Travertine tiled flooring, not just in its appearance, but also in terms of its now polished texture. 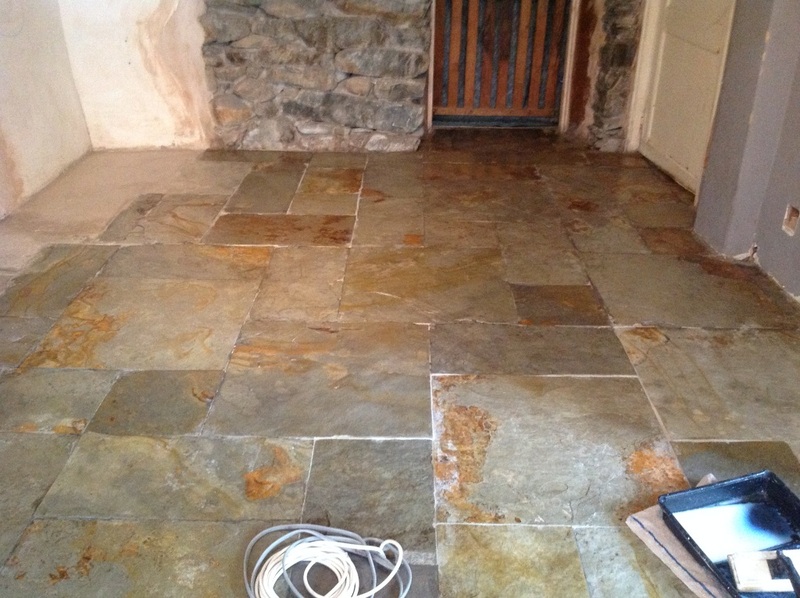 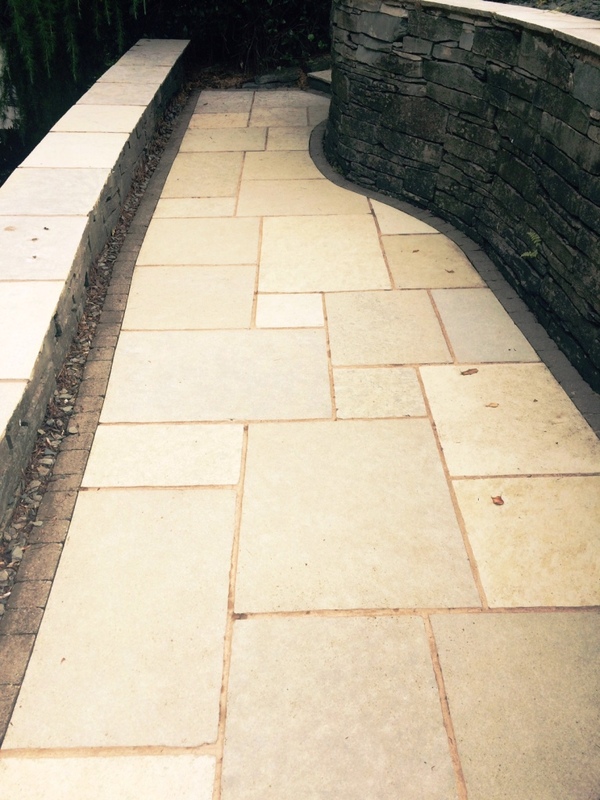 This job was at a house in near Windermere in South Cumbria, a place which is very popular amongst tourists to the Lake District. 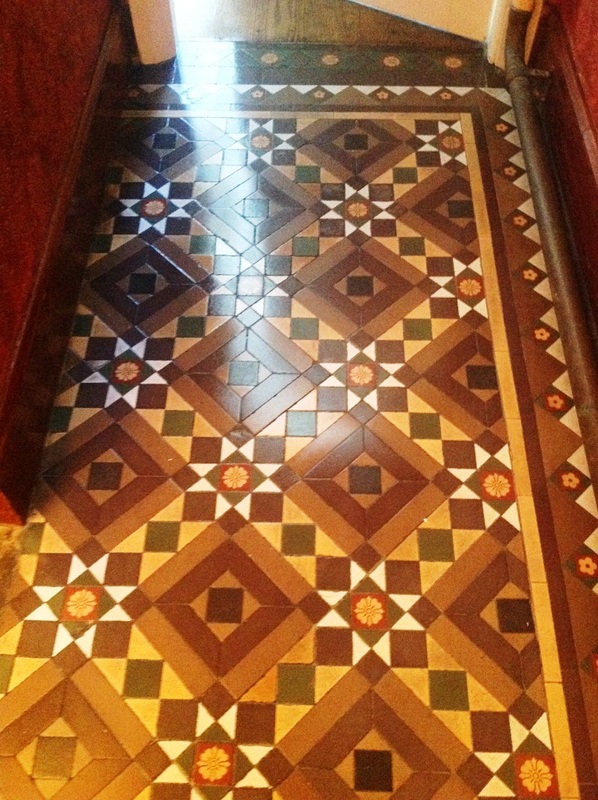 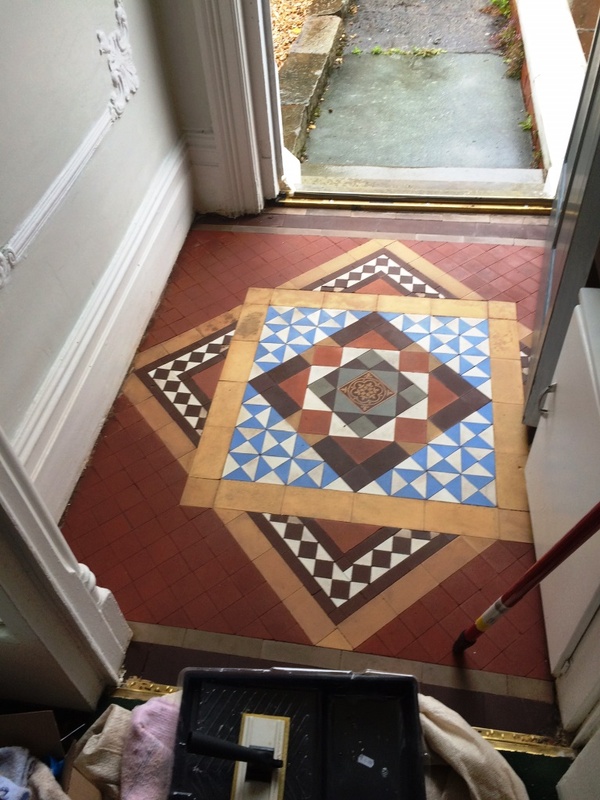 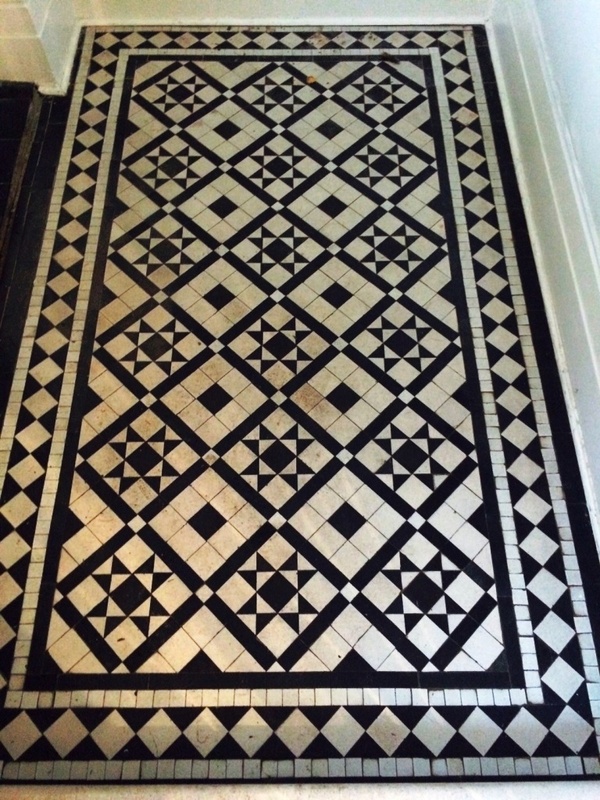 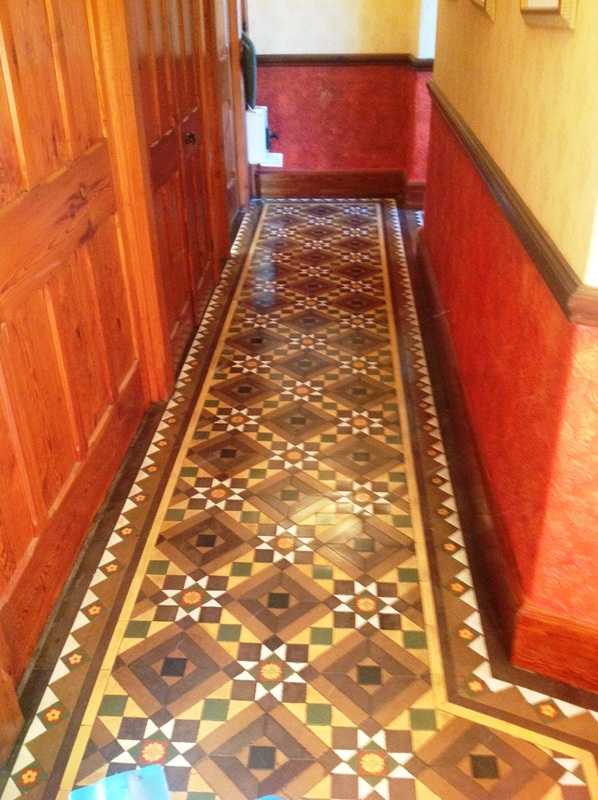 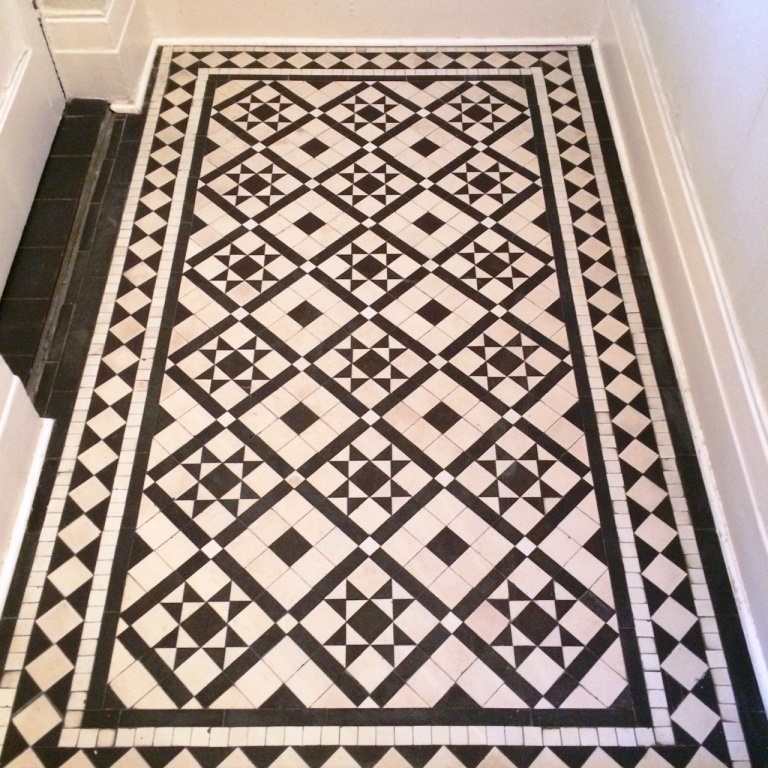 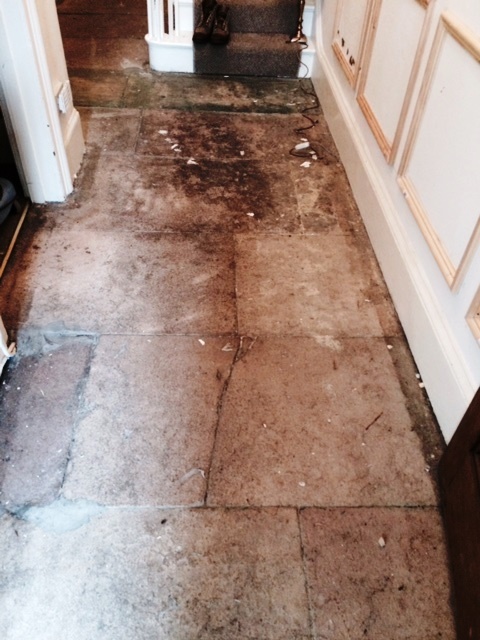 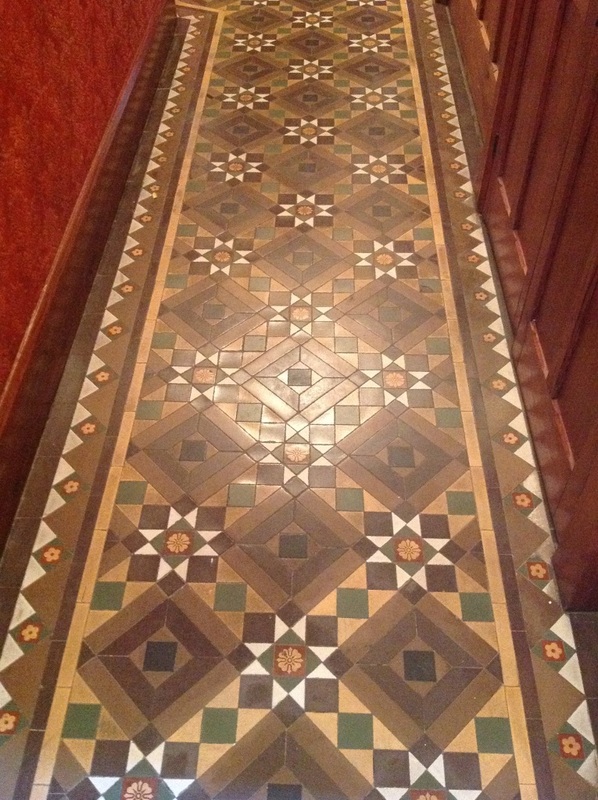 My client had a Black and White Victorian tiled floor in dire need of a clean and re-seal. 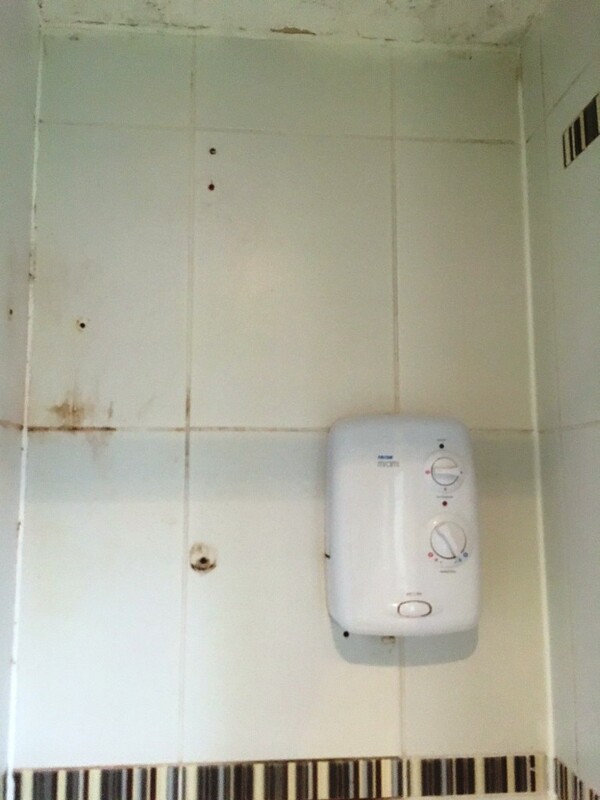 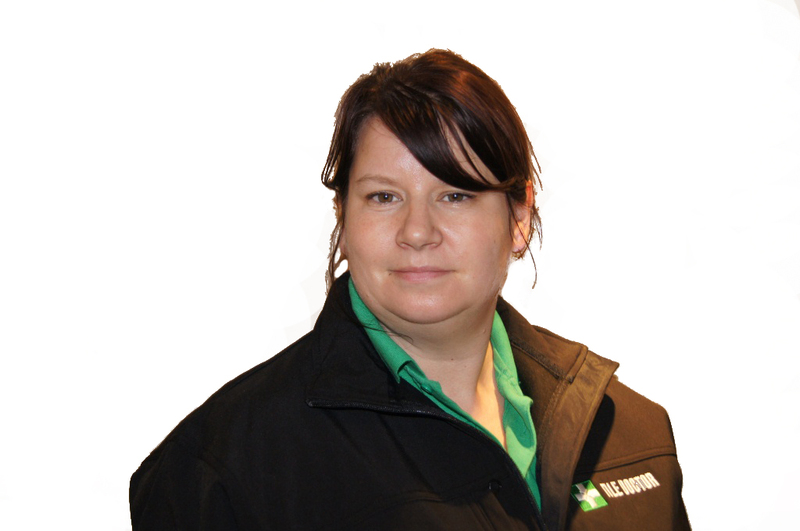 Prior to the application of any cleaning products, my first task was to run damp tests to make sure there were no inherent damp problems. 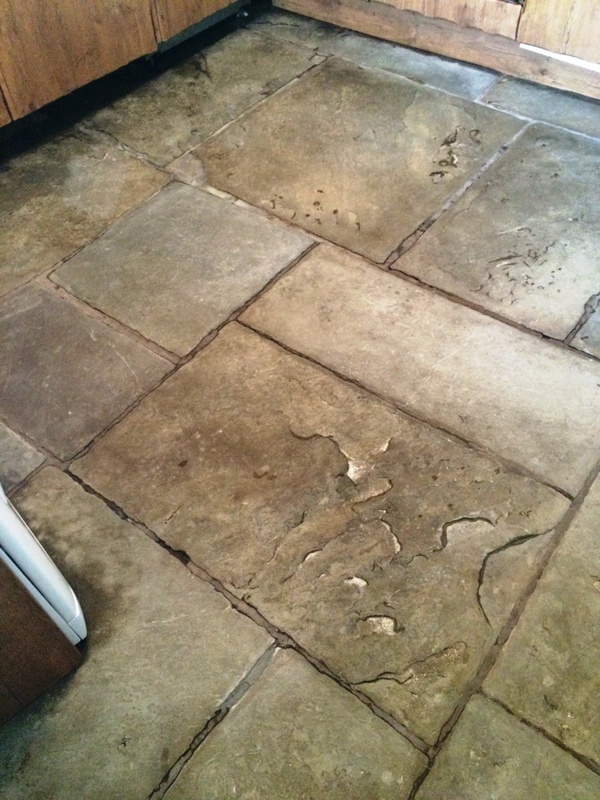 With old floors of this type it’s good to know if there is a damp problem as this will affect the choice of sealer and also the length of time the floor requires to dry. 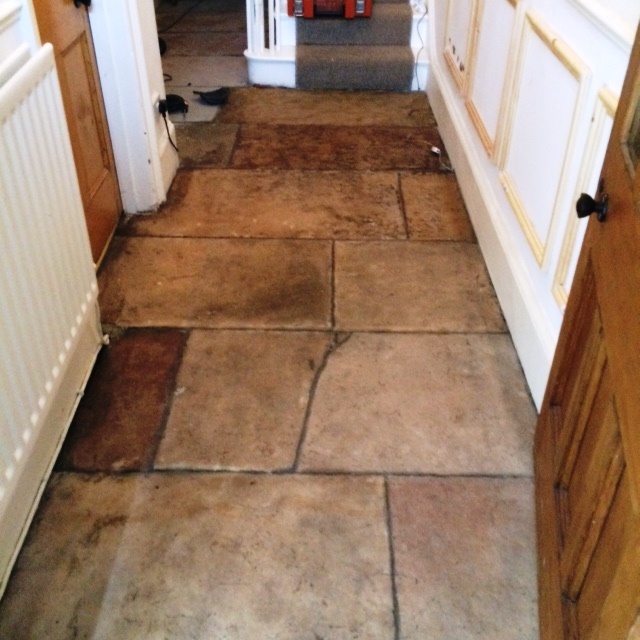 Fortunately, there were no damp issues present, and I was able to proceed however had the floor been damp and being December I would have offered to carry out the clean and seal in the Summer, when the water tables were lower and the damp levels would be more settled, thus creating a better environment for the sealer to operate in. 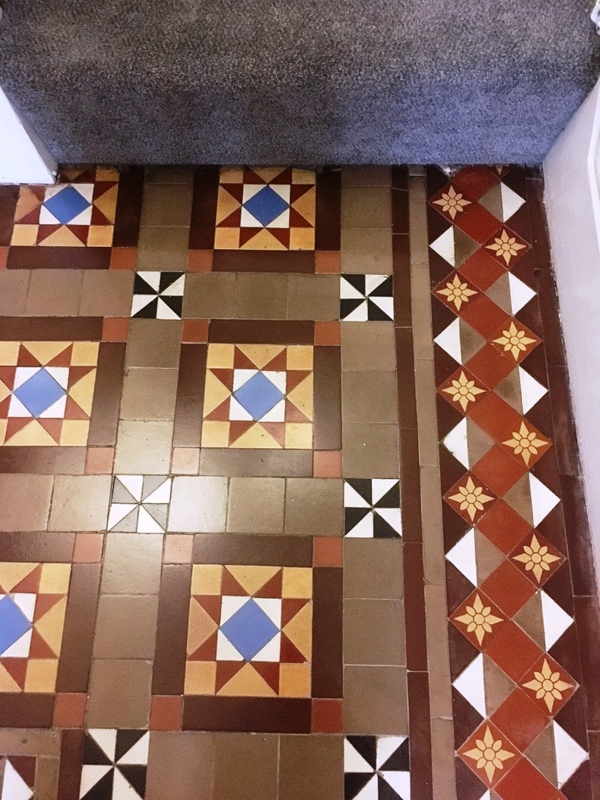 I started cleaning the Victorian tiles with Tile Doctor Remove & Go, a product which breaks down old sealers in preparation for a fresh seal to be applied. 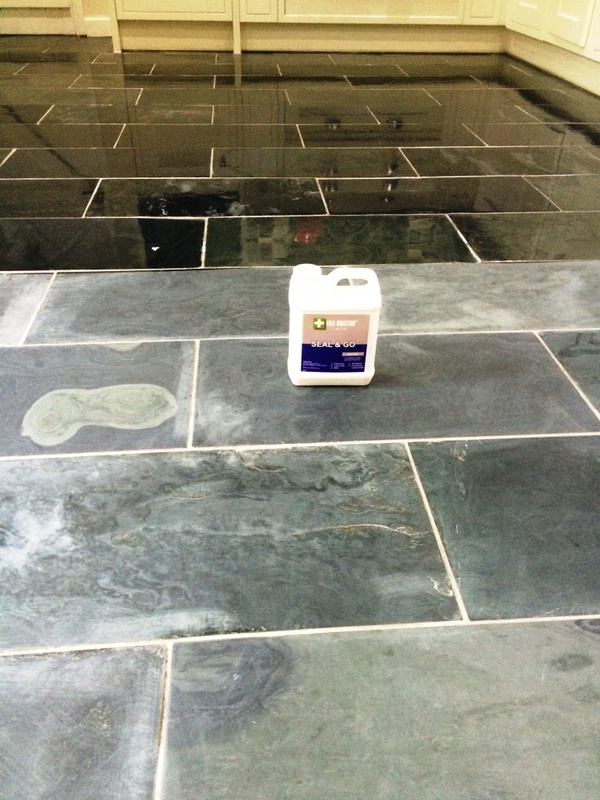 The product is diluted with water and then scrubbed into the floor with a scrubbing pad fitted to rotary machine; the resulting slurry is then removed using a wet vacuum. 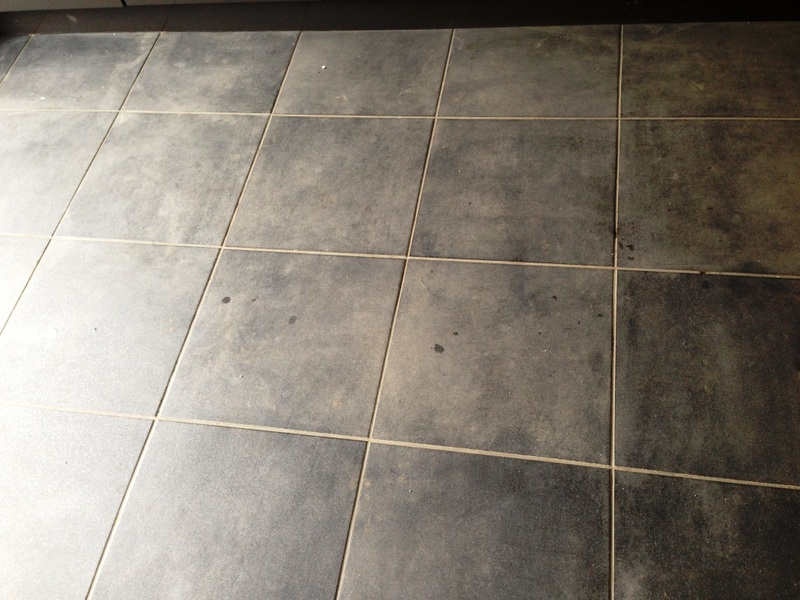 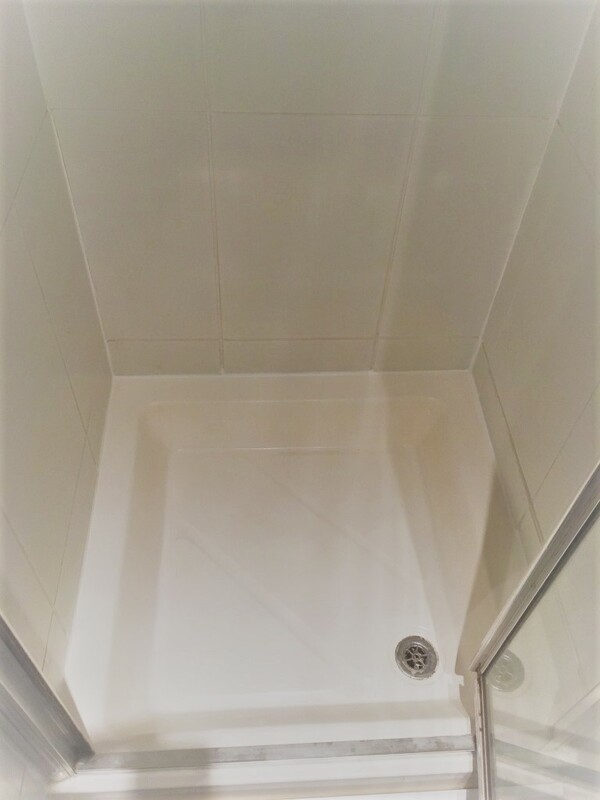 Next step was to apply Tile Doctor Pro-Clean which was applied liberally to the floor, left to dwell for a short period and then agitated with a black scrubbing pad to lift out the ingrained dirt. 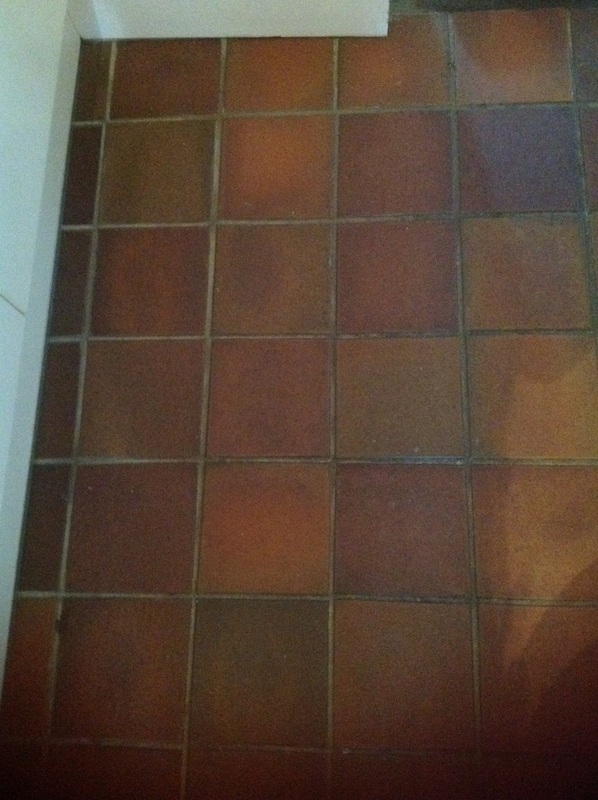 I also paid special attention to cleaning the grout lines with a stiff scrubbing brush. 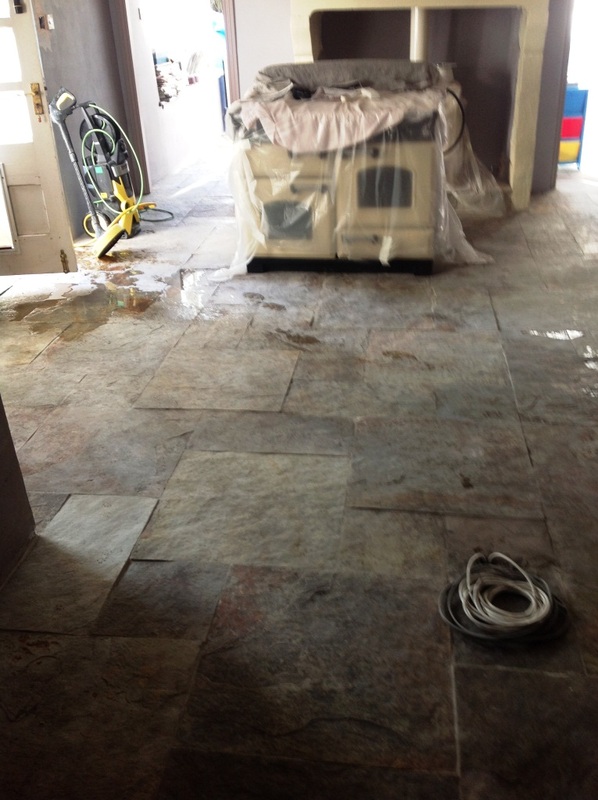 The floor was then rinsed with clean water, and the resulting residue was extracted using a wet-vac machine. 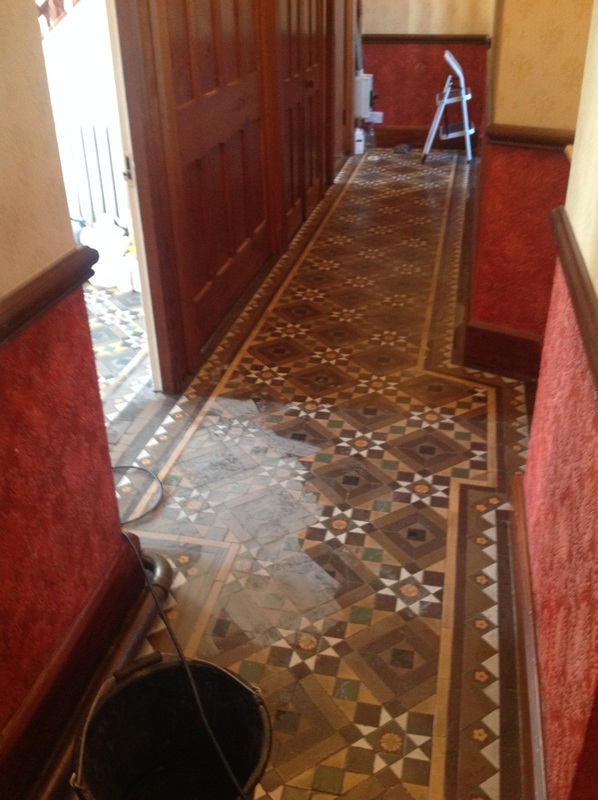 After the cleaning was completed, the tiles were left for a couple of days to allow them ample time to dry. 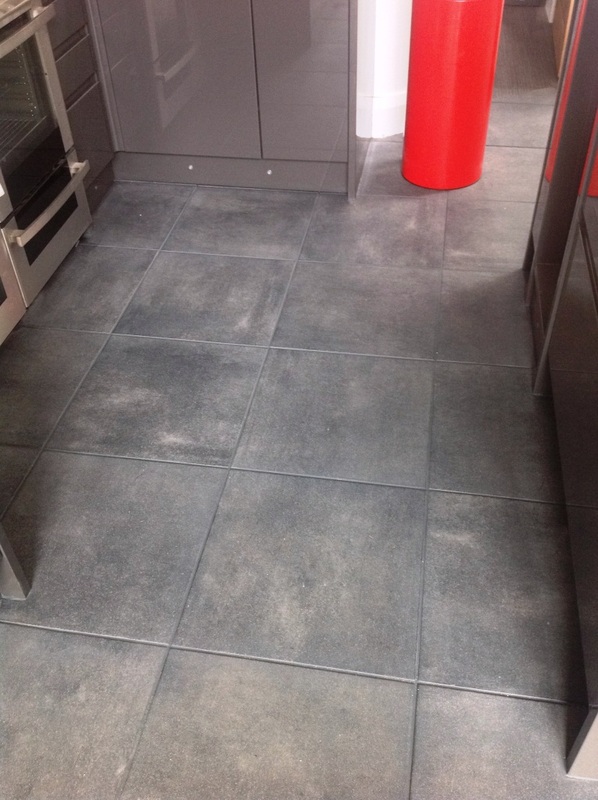 Upon my return to the house I checked the damp levels again and then applied two coats of the impregnating, colour enhancing sealer Tile Doctor Colour Grow which gives the black tiles more depth of colour, along with the robust surface seal and Matt finish my client had requested. 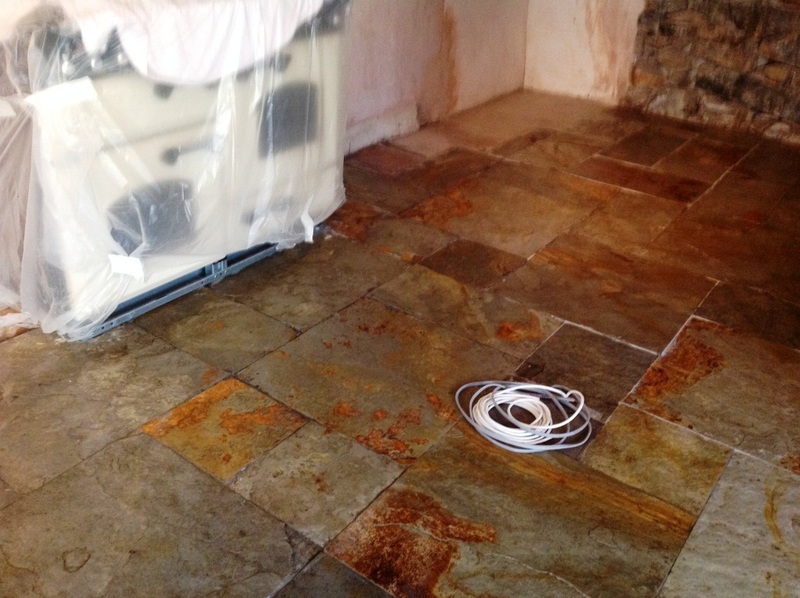 My client was exceptionally pleased the results – but really, the photographs speak for themselves. 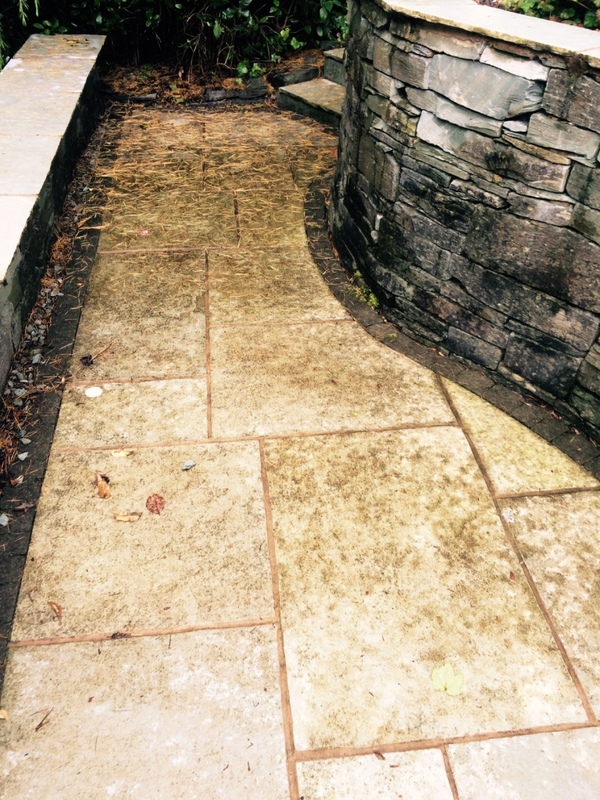 For this job, I paid a visit to the bustling town of Windermere in South Cumbria. 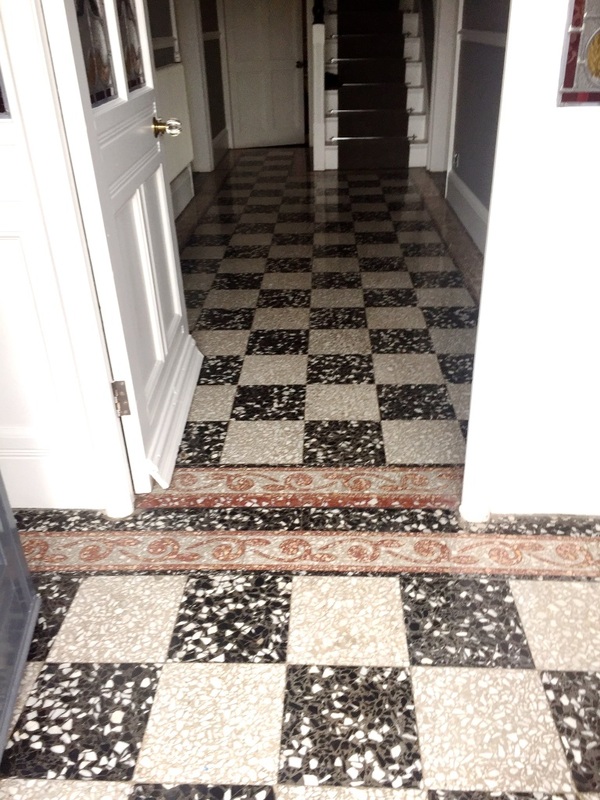 My client asked me to refinish a black and white Terrazzo tiled entrance and hallway floor. 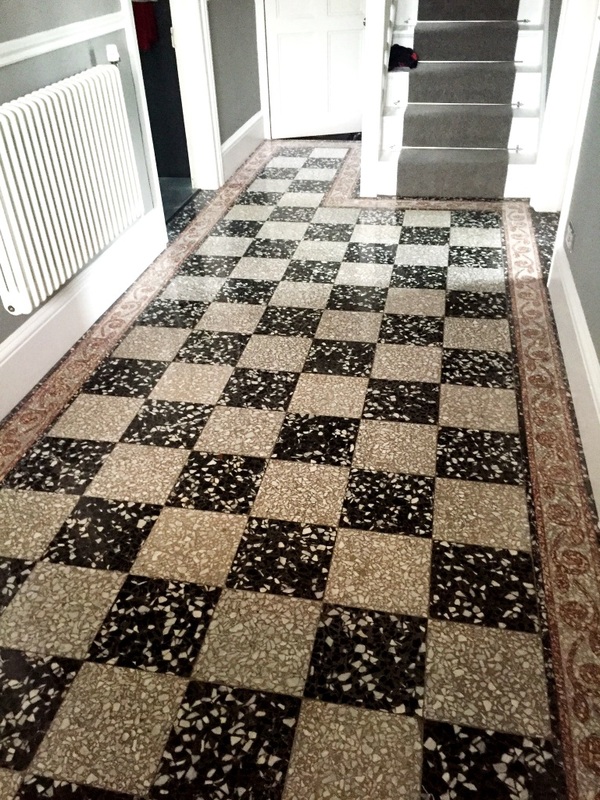 Terrazzo if you’re not familiar is a very interesting and beautiful stone of Italian origin, which has been used for flooring in houses for centuries. 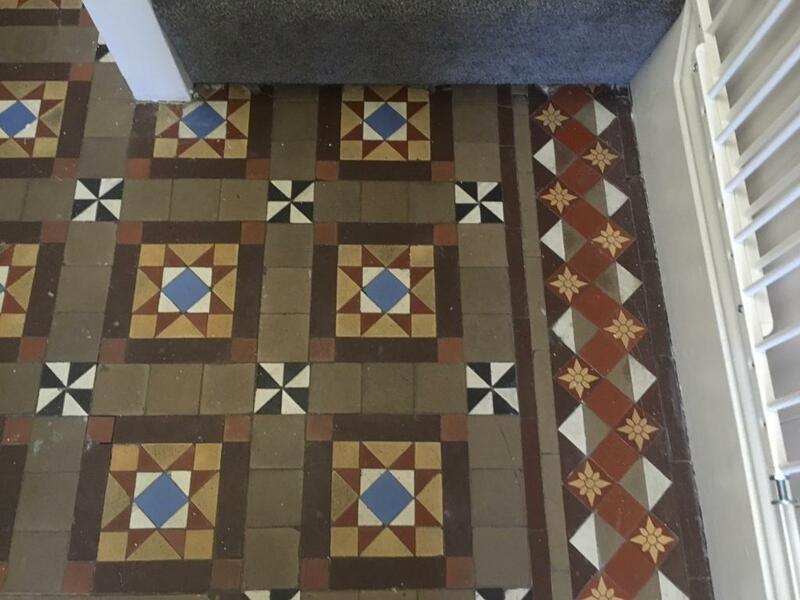 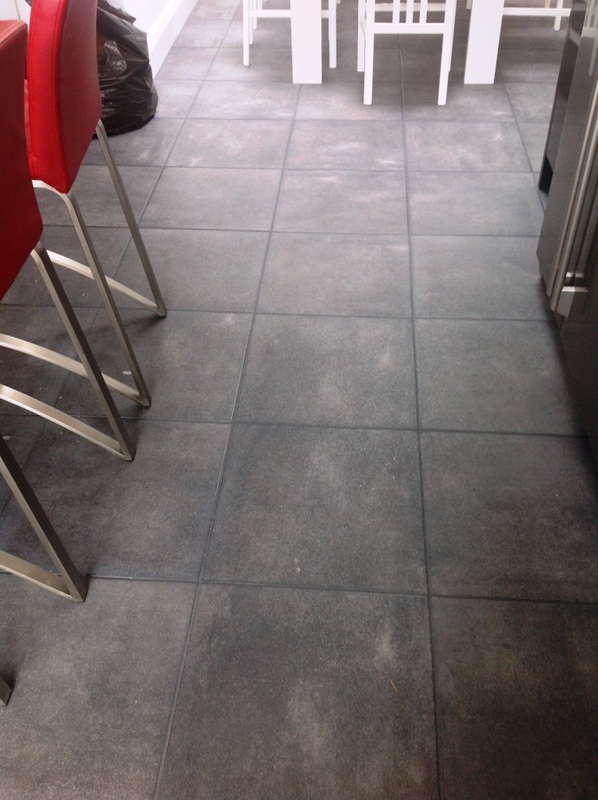 We had previously quoted to do the work on this floor however the customer has also received a quote from another firm in Glasgow and had chosen to go with them solely because they were more expensive. 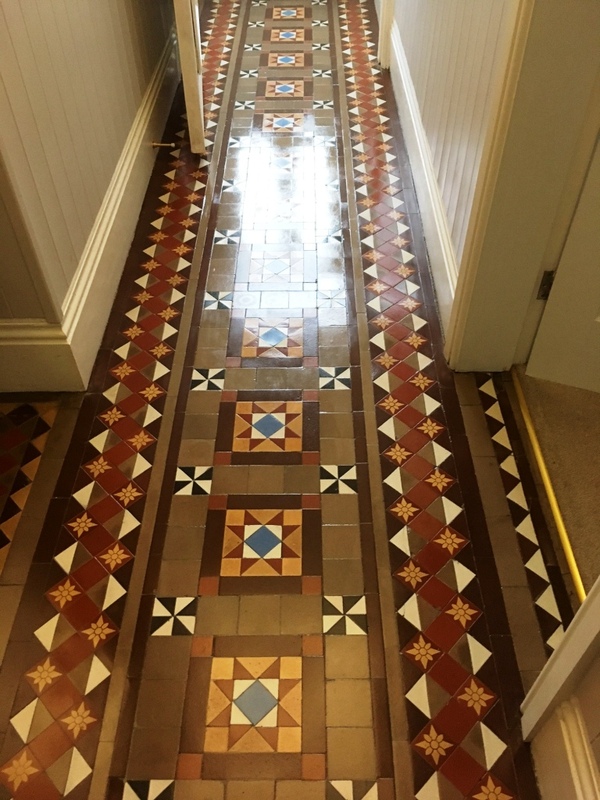 However, it stands to reason that the most expensive companies are not always the best quality and Tile Doctor prides itself on the amount of customer feedback we display on our websites which we believe is a far better indicator. 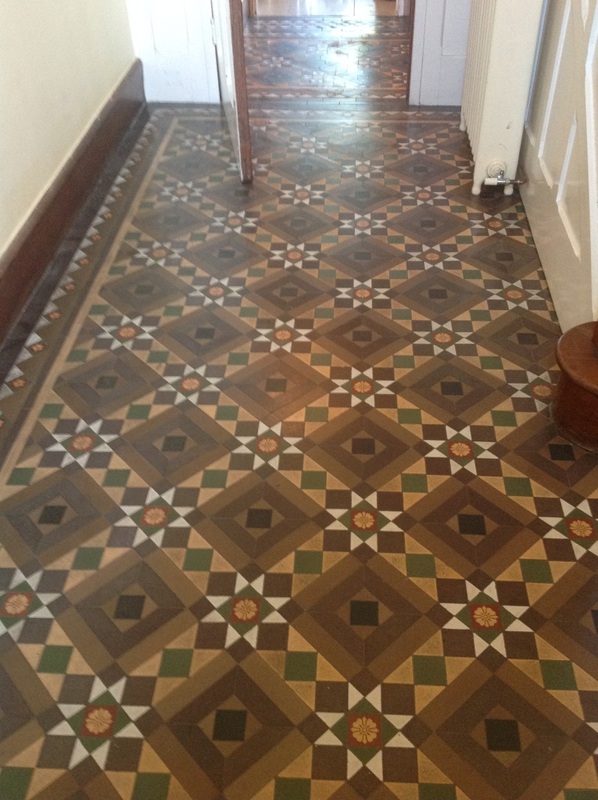 On the arranged day no one from the Glasgow firm showed up and after following up with the firm a young man in his early 20s arrived five hours late and began work on the floor. 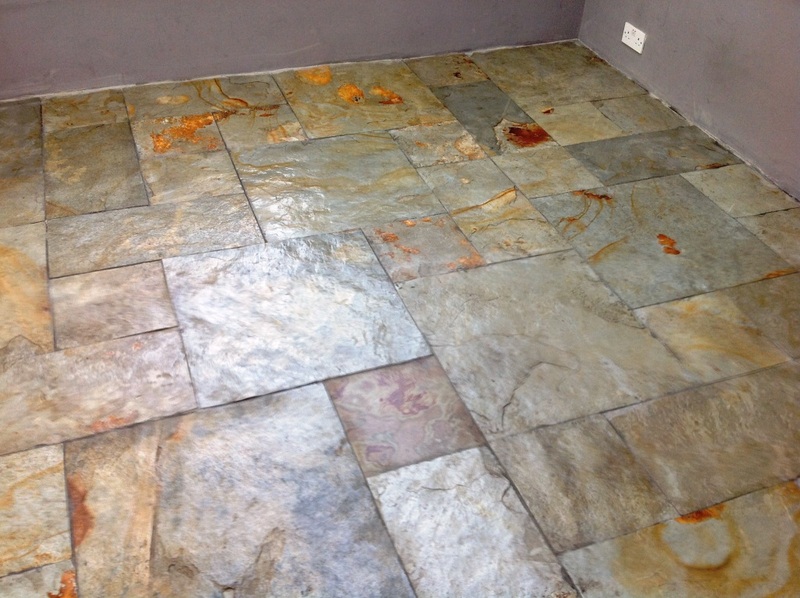 According to the customer he spent three days attempting to complete the job, but ran out of time and asked the client to apply the sealer themselves. 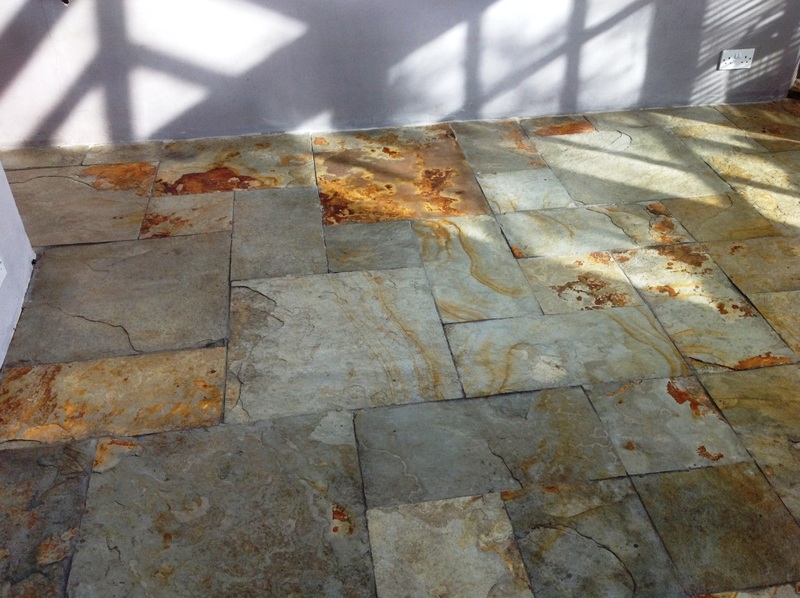 The client applied the sealer, but as she had never done it before the floor turned out blotchy in appearance and she was far from happy. 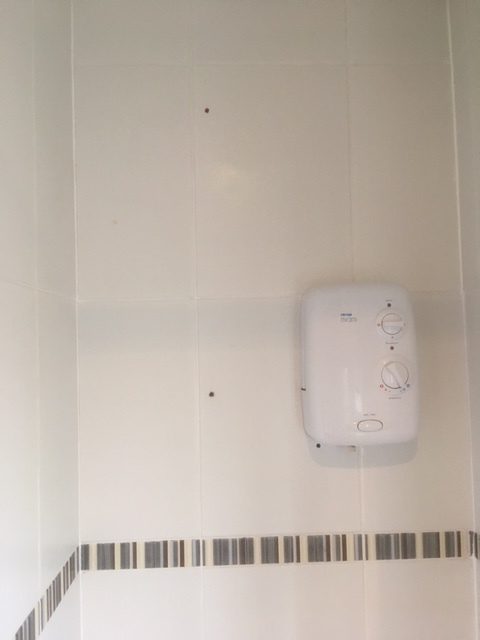 To cut a long story short, my client complained to the Glaswegian company, after all she had paid for a full service and not received it. 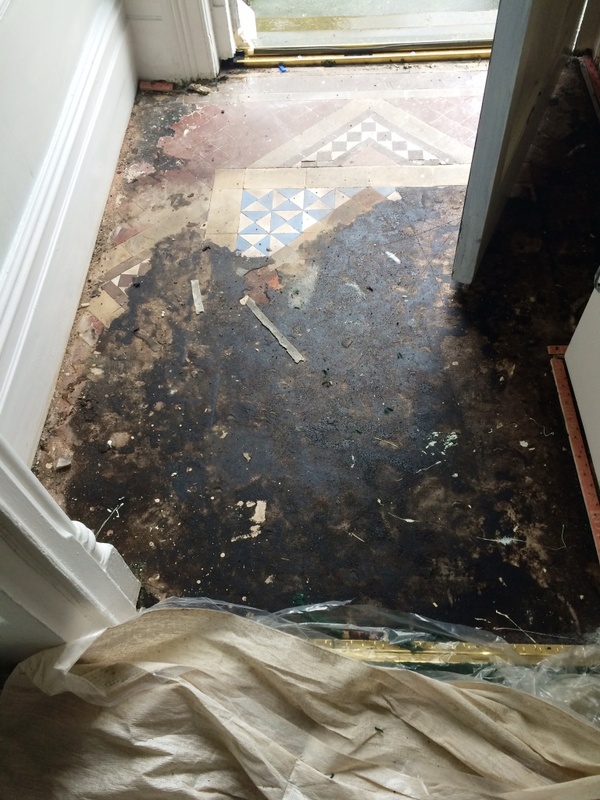 Unable to get a satisfactory conclusion from them she decided to call in Tile Doctor to put the matter right. 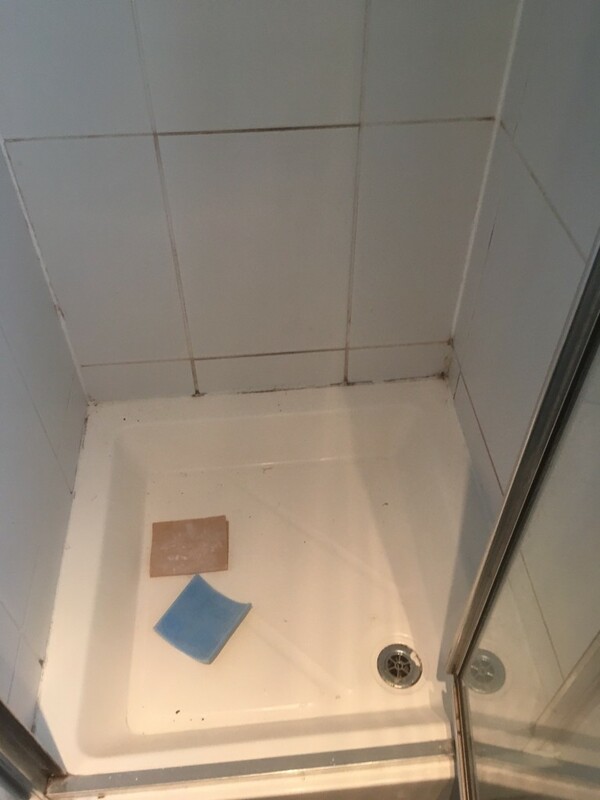 I must point out that although I have included before and after photos one this post it’s really difficult to appreciate the extent of the problem without seeing the floor in real life. 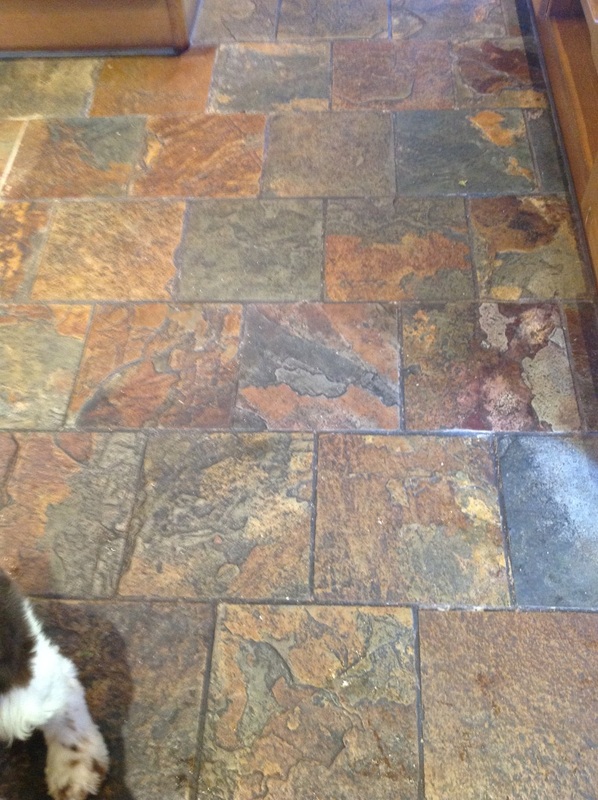 To resolve the sealer, and to provide my client with the polished finish she had originally wanted, I burnished the floor using a set of four Tile Doctor Diamond encrusted burnishing pads. 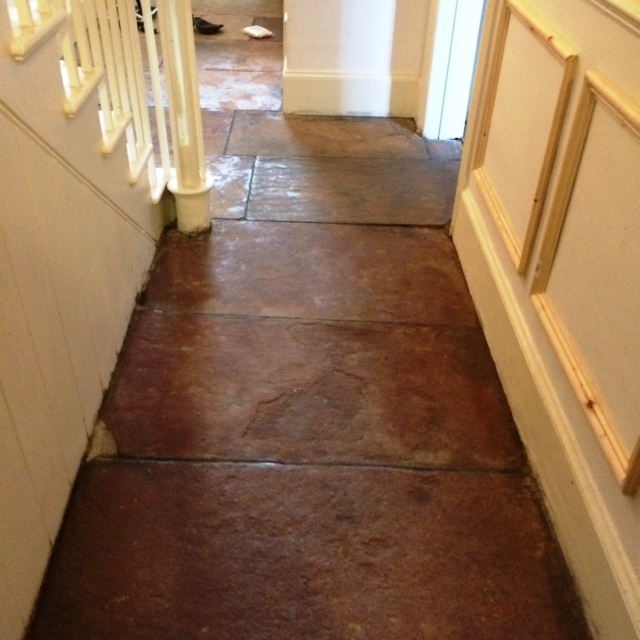 Each of the four pads has a different grit: I first applied the coarse pad and worked my way through medium, fine and eventually very fine using a little water to lubricate and rinsing the floor between each pad to remove any residue; after the burnishing process was complete I gave the entire floor a final, thorough wash. 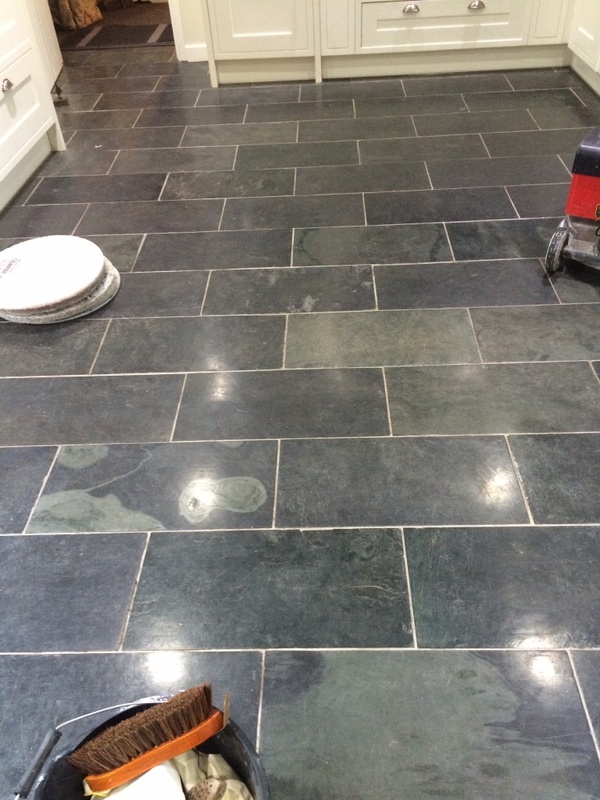 I then used a wet-vac machine to extract the water and get the floor as dry as possible before leaving for the day and allowing it to fully dry completely overnight, it’s very important that the floor is as moisture free as possible before being sealed as it can affect the final result. 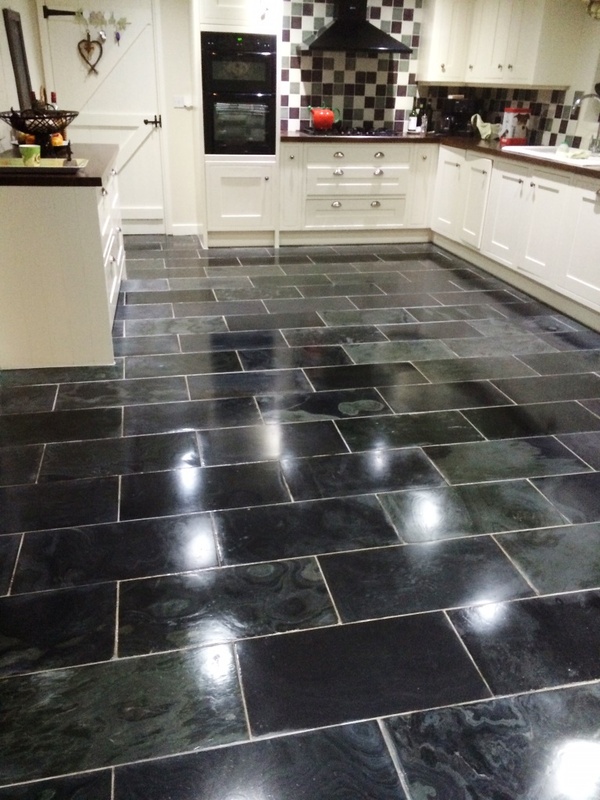 The next day I returned to the house and sealed the floor with two coats of Tile Doctor Colour Grow, an impregnating, colour-enhancing sealer that really accentuates the look of the black and white tiles. 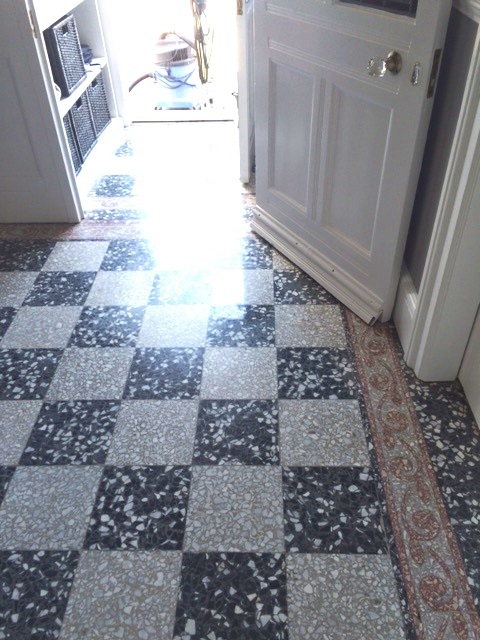 Now that the problem has been resolved, my client is very happy with the condition of her Terrazzo tiled entrance and hallway floor.